Freestone or rain fed rivers. These are the most common trout streams worldwide. The chances are you will be fishing one of these. They are exciting rapidly changing systems subject to flood and drought. Fish density is relatively low compared with most chalk streams and tail waters. The fish that inhabit this type of stream are generally wild and often we cannot see our intended quarry. We generally wade these types of stream. They often form distinct river pools that will be considered in detail below. Chalk streams or Lime creeks. Chalk streams are far more stable environments. They can be far more canal like than freestone rivers and often wading is not permitted. The high pH supports a large invertebrate community which in turn feeds the trout. As a consequence they tend to be more fish dense than freestone rivers. The crystal clear waters mean we often fish to sighted trout. Many have restrictive rules such as upstream dry fly only. The chalk aquifers regulate the flow of the river. Therefore the water level varies less than in freestone rivers. The stability and clear water can make trout very difficult to catch. Tail waters. A man made dam built on a freestone stream results in a tail water. The dam acts to control the flow of water into the stream and buffers heavy flooding. They are generally more stable but similar in nature to freestone rivers. The same rain fed or freestone river pool showing its "bones" in summer and swollen in early spring. The advice I offer is based on experience with freestone rivers and tail waters although much of it is still useful for chalk streams. With this in mind next we need to consider the trouts pool and understand where and why trout live in streams. Most non fly fishers assume that trout are distributed in rivers like currants in a bun. Randomly here and there. Or that they live in shoals in the deepest slowest part of the pool. 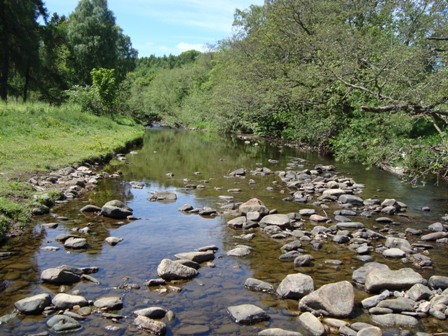 By considering the zones of the river pool and understanding what trout actually need from their environment namely protection from predation (or "shelter") and a food supply a much clearer picture of the lifestyle of trout emerges. 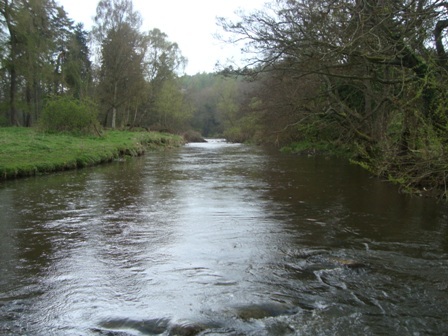 With this image in your mind you may well be able to make good catches of trout very early in your fly fishing career! This is characterised by the fastest flowing water (at least relative to the rest of the pool), often turbulent with many rocks and boulders. Most beginner fly fishers walk straight by it heading to the middle or belly of the pool where they assume the fish will be. In fact a lot of people browsing the rest of the site will do the same! Indeed there are probably some fish in the middle of the pool but on most streams the highest concentration of fish will be near the head of the pool. Fast turbulent broken water supplies the trouts main needs, shelter from predation and a food supply. The fast broken water gives the trout perfect camouflage from aerial predators, bears etc. And trout as explained below eat aquatic insects (amongst other things) living on the stream bed. These aquatic insect populations are highest in faster water where dissolved oxygen levels are higher. In addition the fast often turbulent water dislodges one of these beasties from time to time supplying the trout with a meal. But what about that fast current....Does the trout have to swim like crazy to stay there? Trout are rarely exposed to the fastest exposed currents and tend to live in depressions often created near rocks. This home is known as the trouts lie. Far from swimming like crazy the pressure differences around the trout are effectively zero because of his torpedo shaped profile. He uses the same down forces that an F1 car uses to stay on the track to maintain his position. Tiny movements of his fins keep him in perfect apparently static motion as the stream flows by. He has ultimate control and expends very little energy rather like a glider. The most important aspect of this from a fly fishing perspective is that these fish can be relatively easy to catch compared to fish elsewhere in the pool. For example here is a student who I taught a method known as Czech nymphing. These snaps were taken after 2 minutes tuition. She hooked but lost a very large trout and a grayling in bright sunshine after only 10 minutes. She can't yet cast a fly line but she is already catching fish and so can you. Yes I know you want to know which rod and reel and be on the river now. Patience. Hopefully you will now understand that to leap straight into tackle selection would be folly. An understanding of where and how you will fish will have an impact on that selection. Current seams that run through the pool can be thought of as a conveyor belt carrying the trout's menu. Therefore trout are never far from these. Features such as overhanging trees (providing shelter and food) are often hotspots if combined with river flow as are rocks or anything that deflects the streams flow. Rising (surface feeding) trout are often seen in the middle of the pool. This is the main reason they are very popular for fly fishers. On the best streams it is possible to wade a great deal of the middle of the pool. Fishing the middle of the pool requires some casting ability because we fish at greater range. We will see in the next link the trout why this is the case. Here the river becomes shallower and often wider and faster flowing. This is difficult water to fly fish and you will not be concerned with this at this stage. Now we have a basic understanding of the trouts pool lets have a quick look at the trout itself.